You can safely plant and grow vegetables for your kitchen garden in containers as long as you give your plants the essentials: well-drained soil, good air circulation, and full sun. Using containers for your kitchen garden is always a good way to make sure your veggies stay on track. Plant your seedlings safely into your container garden. Kitchen gardening is made easier when you use containers, and they can be placed in any area, moved with the sun and replanted as it is needed. 1. Fill an appropriately-sized container with a well-drained and fertile potting mix. Make sure your container has drainage holes. 2. Dig the planting hole slightly larger than the root ball. Add a handful of rock phosphate or bone meal to the bottom of the hole at this time to boost future blooming and fruiting. 3. Carefully remove your seedling from its original container by inverting the container while your fingers straddle the stem of the plant. Gently squeeze the container and tap it lightly to allow the root ball to separate from the sides of the pot. Avoid pulling the plant out by the stem or leaves as permanent damage may occur. 5. Water thoroughly with a starter fertilizer. 6. 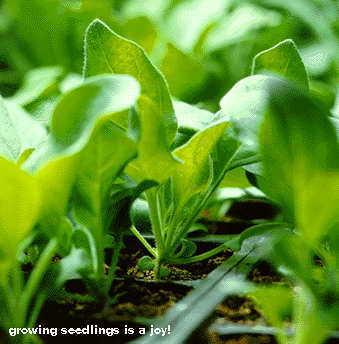 Place your vegetable seedlings in the appropriate site as described in Choosing a site. 7. Check your seedlings daily for water needs. Water evenly and consistently. Container plants require more frequent watering. 8. Mulch your seedlings as soon as they are several inches in height. Mulch helps retain soil moisture. This is my first year that I&#x27;m planting seeds in containers. Thank you for sharing such helpful information, because I did not know about these extra details. I appreciate it. although i have a vegetable bed i am definitely going to use containers this year- they are just easy as pie, and especially good for the herbs. going to buy some cheap ugly containers, paint them with chalkboard paint and then use a chalkboard pen to write what&#x27;s in the container! FigTree, you come up with some of the most fun ideas for your garden. Please keep us posted and upload some pictures as this project progresses. I never would have thought to use chalkboard pain and special pen...much better than those plain, white plant markers.